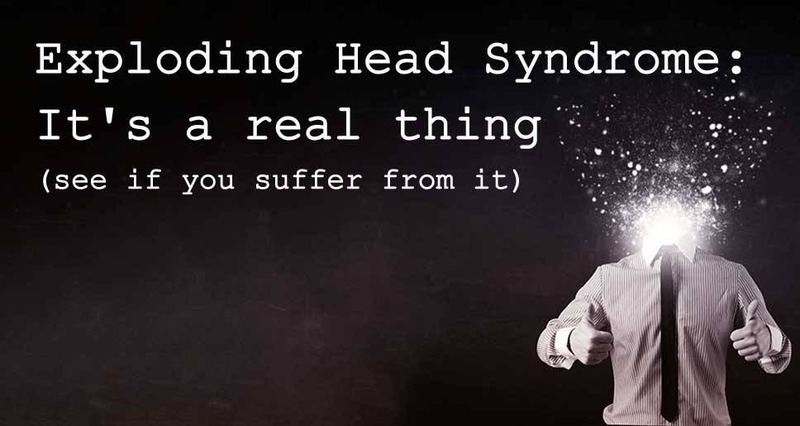 When I first heard of “Exploding Head Syndrome”, naturally I was immediately interested. I mean, if there is a syndrome out there where my head is going to explode, it’s time to study up. So, as it turns out, Exploding Head Syndrome has nothing to do with your head actually exploding. Imagine my relief. But, for many more people than previously expected, Exploding Head Syndrome is very real, and can have a very negative effect on your life. In a recent study at Washington State University, it was found that a surprisingly high number of college students experience what is known as “Exploding Head Syndrome”. This is a condition where the person affected gets woken up by loud, sudden, imaginary noises like a bomb being detonated or cymbals crashing. Initially it was thought that this condition only affected people in their 50’s, and it was very rare. Turns out is pretty common among college students. Brian Sharpless, a Washington State University assistant professor and director of the university psychology clinic, says that for some students, the condition is so bad that it affects their lives. “Unfortunately for this minority of individuals, no well-articulated or empirically supported treatments are available,” says Sharpless, “and very few clinicians or researchers assess for it.”Researchers think that the reason the condition exists is because of the way your brain shuts down when you sleep. The auditory neurons are one of the last systems to shut down, which makes sense if you’ve ever fallen asleep to the TV or radio. For people with exploding head syndrome, the neurons don’t shut down – they fire all at once. “That’s why you get these crazy-loud noises that you can’t explain, and they’re not actual noises in your environment,” according to Sharpless. Another surprising find of this study is that people who suffered from Exploding Head Syndrome, also suffered from sleep paralysis. Sleep paralysis is terrifying, if you’ve never experienced it. Basically, you wake up but you can’t move or speak. You’re totally coherent, but you can not move. It usually only lasts a few seconds, but I’m here to tell you – it seems like an eternity. The first time it ever happened to me I thought that I’d had a stroke, or was about to have a kidney harvested from sketchy woman I met at a bar. I’m pretty sure I’ve had this happen to me at least a few times, and my “explosion” sounds like a door slamming. To be honest, I always just thought it was a ghost. No Kidding. It’s cool to know I am not the only one who experiences weird sleep conditions like this, and if you do too – you are not alone. Try a little meditation before bed to get your brain primed to shut down, and focus on getting the best sleep you can, sleep is essential for emotional and physical health.